I have posted about 600 more photos from our World Youth Day pilgrimage to Australia on my Flickr account. Since I have determined that my monitor is not displaying correctly, these are all uncorrected, so sorry if they are too light or too dark or the wrong color — I wouldn’t normally post them like that. This particular one is one of my favorites. 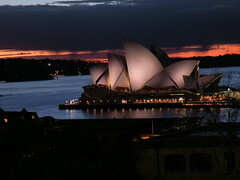 We woke up before dawn to walk down to the Sydney Harbour Bridge to watch the rising of the sun over the harbour.